Global awareness and international collaboration during the formative years encourages students to see things from different perspectives and help them make informed decisions, acquire transferable skills that will help them adapt to a changing world in their life. We live in an interconnected world in which decisions taken in one place can affect people living on the other side of the planet. However, the idea of global interdependence goes further, recognising that even the wealthiest countries rely heavily on other countries’ riches – from physical commodities like food and minerals to knowledge and culture. In keeping with our Founder’s vision to provide avenues for holistic development of students, Omega International School takes great pride in introducing the various aspects of global dimension to students right from their formative years that will help them be better citizens of the world. To promote an open-minded, reflective global outlook. International mindedness is a core principle at Omega International School. With international curricula and students from over 20 countries, our aim is to continuously weave connections spiritually, culturally and through our social ethos. This is reflected in our motto “Saha Veeryam Karvaavahai” which means “Let’s Endeavour Together”. In developing key projects that address critical issues; such as management of natural resources with specific focus on water, sustainability, cultural diversity and biodiversity, and media literacy we involve subject experts and students to deliver thoughtful presentations for the dossier. The ISA opportunity helped us drive meaningful and substantive pedagogical activities that at the same time fostered global thinking and cross-cultural perspectives. 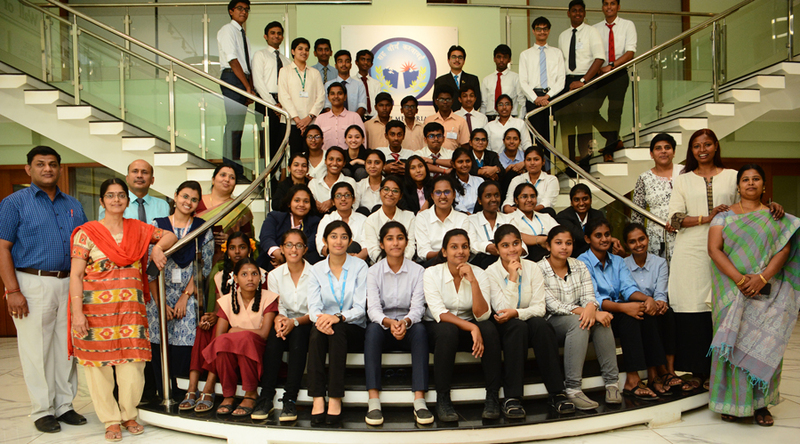 Omega’s Action Plan comprised seven meaningful projects that spanned across all subjects taught at school and involved students from across grades KG to XII. Efforts were underway for a year long as students researched and collated information that provided fresh insight while being comprehensive. Cross-cultural perspective enriched our understanding and we benefitted immensely from the dialogue with our partner schools, especially IES Puig de Sa Font, Spain. Differential learning is a cornerstone of any classroom exercise. Our project, “Inclusion inspires learning” addressed this through several activities that sought to include the disadvantaged, in helping students understand the importance of sharing across differences. Activities comprised research and field visits, class room presentations and co-curricular activities like Plays and Poster Making. An important way to introduce global issues and international mindedness among students at Omega is through their involvement and participation in the various United Nations initiated programs. These programs open up avenues unlike others, where students also understand, research and study grassroot problems to a global crisis, i.e., Climate Change. All the UN programs at Omega are student initiatives and information about the programs and our level of involvement are available under Student life > UN Programs. Through our presence across international channels and at various UN programs, Omega students are invited by foreign schools to collaborate on specific days and on specific occasions. Omega students recently participated in a video conference with Intellect School in Ukraine, to share inputs for their celebration “India Day”. The session encouraged a mutual dialogue about culture, education, values and belief system and paved way for an interesting partnership. The session was also witnessed by the Indian Ambassador in Ukraine, Mr. Manoj Kumar Bharti. The International Award for Young People, formerly known as the Duke of Edinburg award, is a balanced program of voluntary self-development activities where students can undertake the same at three levels – Bronze, Silver & Gold. More information about the IAYP program is available under Clubs of Omega. This is a self-development programme for students, focussed on service to community, personal skill development, physical recreation as well as adventure activities or expeditions.